The spotlight, or rather the sunlight, may soon shine on an overlooked piece of infrastructure in the downtown Baldwin Parking Lot. 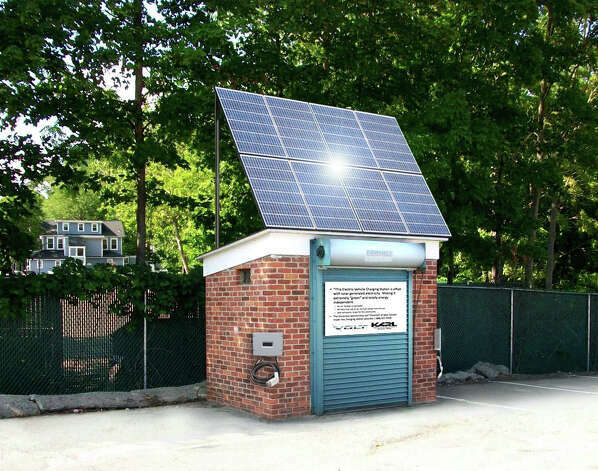 Tony Eason, owner of Elektron Solar, a Westport-based business that specializes in solar photovoltaic system installations, is seeking to build a solar-powered electric vehicle charging station on an electrical shed in the town-owned Baldwin lot on Elm Street. The facility would use a solar PV array on top of the brick shed to feed power to electric vehicles during two-hour charging sessions. Construction and maintenance of the 1.84 kilowatt EV charging station would be funded by Elektron Solar and revenue from a private-sector sponsorship. The prospective downtown EV charging station would likely entail the town leasing the electrical shed to Elektron Solar. The building holds equipment for lighting in the Baldwin lot. Eason presented his plans to the P&Z during a pre-application hearing, which is an informal and non-binding review session.